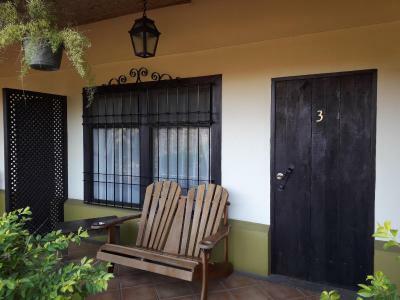 Lock in a great price for Dos Palmas Studio Apartments – rated 8.6 by recent guests! 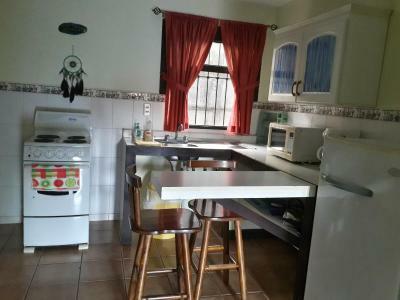 This place has a great location, very close to the airport. The check in and out was easy. The room was ok, bed was comfortable, I’m glad I got my own pillows, the shower was clean. The towels where super old. Breakfast and coffee was good. The staff was very helpful. They provided a breakfast to-go since I was leaving early. Perfect spot for when you need to catch an early flight. We stayed here on the first and last nights of our trip to Costa Rica, and both experiences were good. The staff went above and beyond to be helpful, even packing up some sandwiches and apples the night before so we'd have breakfast before our early morning flight. Was easy to get there from the airport, since it is well known around the Juan Santamaria Intl Airport (eg airport employees, taxi drivers, rental car company employees knew it by name). I was worried that there would be a lot of noise during the night from the airport, but in fact there were not many airplanes coming and going in the middle of the night, so I slept fairly comfortably. Our hosts Deborah and Sonder were extremely helpful, friendly, and knowledgeable. They made every effort to make our stay enjoyable. 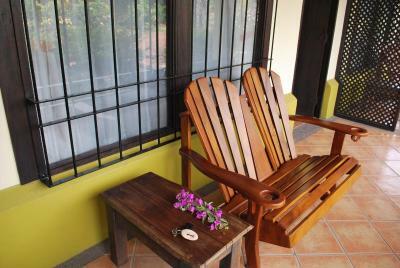 The room was comfortable with a nice outside areas for sitting and enjoying the pleasant climate. 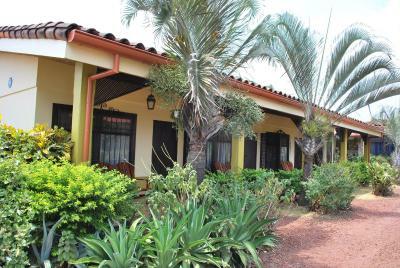 The property is secure and very convenient to the airport so perfect for flying in or out of SJO. 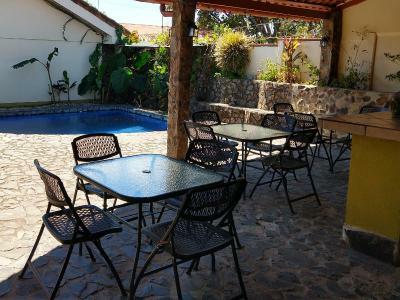 We will be returning to Dos Palmas whenever we visit Costa Rica. Two things: the owners are very friendly, helpful, and welcoming; also the location is very convenient for flying into and out of San Jose. The breakfast was wonderful. The staff were very accommodating. The transport to and from the airport was a great perk. Close to the airport and very clean. Staff was very efficient. Staff & owners were very friendly and eager to ensure we had a comfortable stay and everything we needed. They catered beyond expectations. 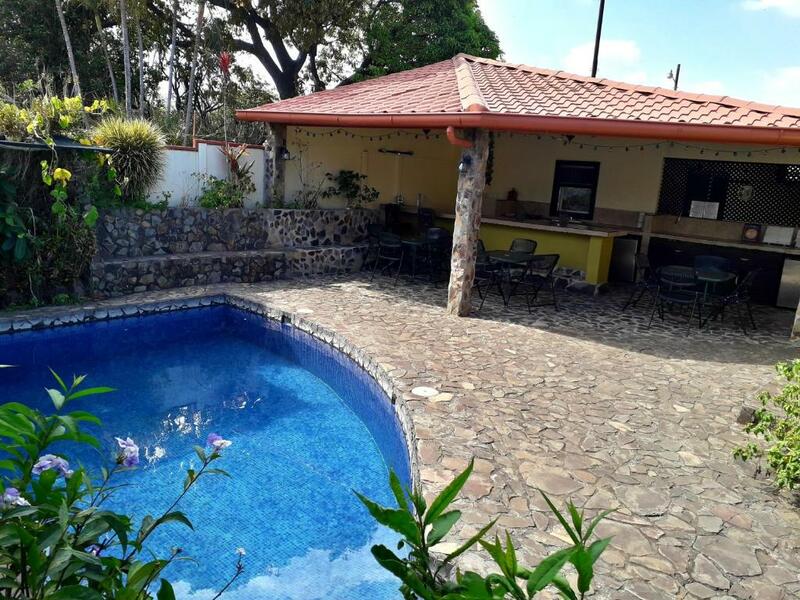 Although this property would be an acceptable stay at any time during one's trip to Costa Rica, its proximity to the airport combined with the hospitality and amenities makes this property the best choice for an arrival to or departure from the country. Highly recommend. This hotel would have been nice - pretty grounds, great international staff (interns), wonderful breakfast with made to order eggs, but the noise was offputting - trucks, planes and trains all competed to drown each other out. So if you are a deep sleeper go for it. Nothing was unacceptable but it isn't a Hilton, this place is simple, clean, unique, and cozy. Featuring free WiFi and an outdoor pool, Dos Palmas Studio Apartments offers accommodations in Alajuela, 9.3 mi from San José. Free private parking is available on site. 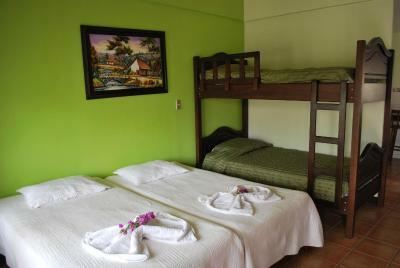 All rooms include a TV with cable channels.All the units have a seating area where you can relax. You will find a kitchen in the room. 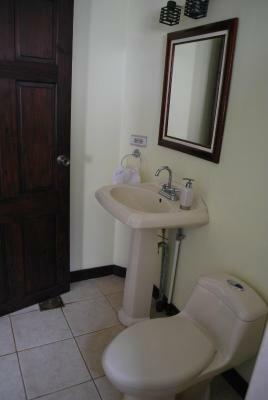 All rooms have a private bathroom and terrace. There is free shuttle service from and to the international airport, for international flights only. 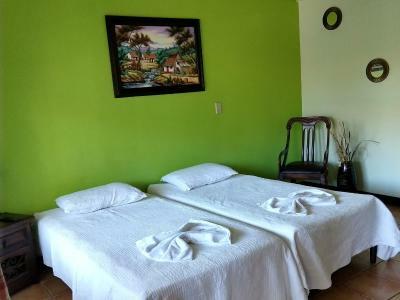 Escazú is 6.8 mi from Dos Palmas Studio Apartments, while Heredia is 5 mi from the property. 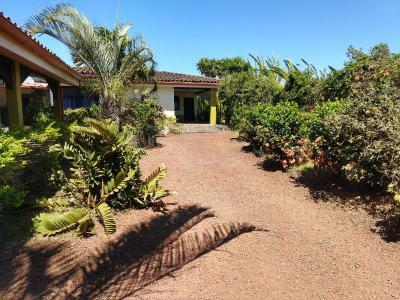 The nearest airport is Juan Santamaría International Airport, 1.2 mi from the property. When would you like to stay at Dos Palmas Studio Apartments? 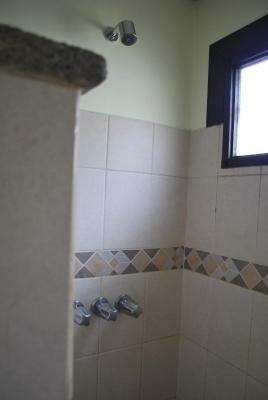 This double room features a seating area, tile/marble floor and dining area. 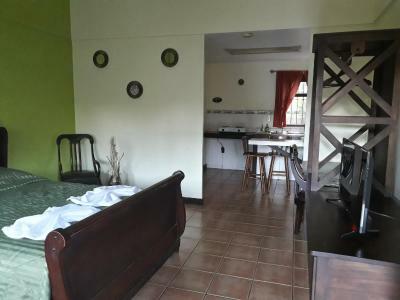 This quadruple room has a tile/marble floor, microwave and dining area. 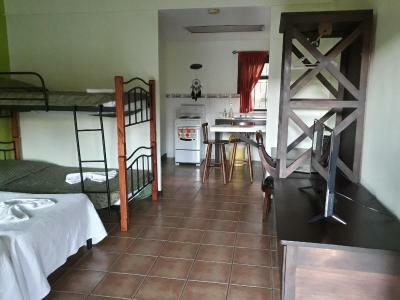 This double room has a seating area, tile/marble floor and microwave. House Rules Dos Palmas Studio Apartments takes special requests – add in the next step! Please inform Dos Palmas Studio Apartments of your expected arrival time in advance. You can use the Special Requests box when booking, or contact the property directly using the contact details in your confirmation. This time it was a lot of different kind of bugs in the room. The cleanliness in the room was also mutch better at our last visit two weeks ago. We visit Dos Palmas two weeks ago and got the same room this time. 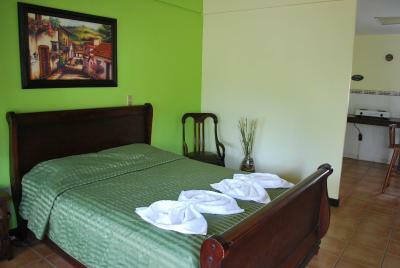 The staff is still friendly, the breakfest is good, the location perfect and the bed is comfortable. Very friendly, most helpful, set me up with a taxi @ 3:00am to airport. Have booked my return stay, will recommend to friends. It is a buzy road just otside so bring earplugs! Perfect stay after a long flight. 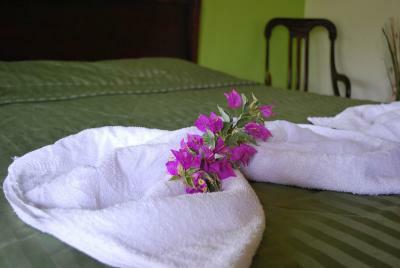 Excellent and superfriendly staff, a good room with a very comfortable bed and a nice garden and porch outside the room. The breakfest was also excellent. The street noise is loud all night long. And the airplanes are very loud but they didn’t have any flights during the night so they didn’t disturb my sleeping. Location is literally next to the airport, which is reachable in 5 min by taxi. Friendly and helpful staff. Nothing I didn't expect given how affordable this place is. There were some ants in the bathroom, there wasn't much hot water for the shower, one of the light switches was a little broken, the bunk beds were squeaky. It's not a fancy place, for sure, but there was nothing about it that ruined my day. But one thing to note, it is on a major road and there is some traffic noise during the night, I slept through it no problem with earplugs but if you're sensitive to noise this might not be the place for you. It is noisy with the airplanes and road nearby! Staff were very kind and it is close to the airport. The noise from the planes was unavoidable, and a bit of light traffic noise also. They only accept local or USD Cash for payment so we had to go to ATM about 5 minute walk away. Great locations if you have a layover in SJO. We spent one night here before our early morning flight. Conveniently located about 5 minutes to the airport and the rate includes a free taxi and breakfast!